The search for dark energy is a search for the expansion history of the universe, from the Big Bang to today. If you find out exactly how the expansion rate has changed over the eons, you can eliminate many theories of dark energy and zero in on its true nature. Many experts in the field say the most straightforward way to plot the expansion history is to catch a wave — a sound wave that was created in the early universe and that continues to reverberate through the cosmos. The Wide-Field Multi-Object Spectrograph (WFMOS) is one of several proposed dark energy searches that will try to catch this wave. WFMOS will plot the positions of millions of galaxies and measure the distances between them. Statistical analysis will show if there is a common “yardstick” for the distances between galaxies at different times in the history of the universe. This yardstick is the size of sound waves imprinted in the universe. As the universe expands, the yardstick expands with it, so measuring changes in the yardstick provides a straightforward view of how the expansion rate of the universe has changed. This information, in turn, will help scientists select the correct model of dark energy. WFMOS will use bundles of several thousand optical fibers, like those that carry telephone calls, to gather light from individual galaxies and feed it to spectrographs that will analyze the light. The analysis will reveal the distance and speed of each galaxy, yielding a 3D map of a large region of the sky. 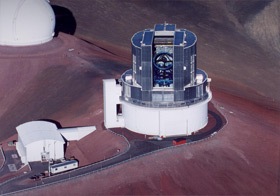 Current plans call for WFMOS to be mounted atop the Japanese 8.2-meter (26.9-foot) Subaru Telescope atop Mauna Kea in Hawaii. Project scientists also are considering a smaller version for the 3.9-meter (154-inch) Anglo-Australian Telescope at Siding Spring Observatory, Australia.